Charles Frederick Ward was born in Headington Quarry in 1868, the son of James Ward (born in Headington on 24 October 1812 and baptised at St Andrew’s Church on 27 December) and Louisa Foster (born in Headington in c.1828). died age nine months and buried in its churchyard on 13 January 1875). Charles's parents spent all their married life in Headington Quarry, which was still in the parish of St Andrew at the time of their marriage and the birth of their first daughter. At the time of the 1851 census father James Ward (38), who was a brick labourer and his mother “Luezer” (22), who was a laundress were living in Quarry with his mother's brother Charles Price (38), who was a stone breaker. Their first child Elizabeth had died in 1849 when only a few months old. In 1861 Charles father James (48) was still a labourer, living in Quarry with “Luesa” (34) and their children William (9), Thomas (6) James (5), and Elizabeth (2). Charles himself was born in 1868. In 1871 Charles (2) was living in Quarry with his parents and his five surviving siblings: William (19), John (16), and James (15), who were labourers, and Elizabeth (12) and Mark (9). In the 1881 census their address in Quarry is specified as The Hammel, and Charles’s parents James (68) and Luisa (52) were home with three of their children John (26), who was still a general labourer; Mark (19); and Charles (12), who was still at school. Also living with them were Charles's maternal grandfather Charles Foster (71), and Charles's niece Florence Ward (1), and a lodger. Charles sister Elizabeth had given birth to an illegitimate child in June 1879: she was baptised as Amelia Louisa Ward at Holy Trinity Church at the age of six weeks on 27 July 1879, but registered as Florence Louisa Ward; and Elizabeth probably left her with her mother to bring up when she was married in 1880. Charles's brother James (24) had joined the army in 1878 and it is likely that his brother William (29) was in the army too. Within weeks of the 1881 census Charles’s father James Ward had died. He was buried in Holy Trinity churchyard on 4 May 1881. On 24 October 1888, at the age of 19, Charles Frederick Ward joined the Oxfordshire Light Infantry (Service No. 3171), where he served for thirteen years. His records state that he was fresh complexioned with grey eyes and brown hair, was 5′ 8½″ tall, weighed 141 lb, and had a chest measurement of 35½″. He served in India for over six years from September 1890 to November 1896 and then at home from 1896 to 1899. From 22 December 1800 to 14 October 1900 he was in South Africa, fighting in the Boer War. At the time of the 1891 census while Charles was away in India, his widowed mother Louisa (66) was working as at home in Quarry as a self-employed laundress. Three of her sons were living with her, all working as general labourers: John (36), James (34) and Mark (30). Her granddaughter Florence Ward (11) was also still living with her. In 1893 Charles’s mother Louisa Ward died at the age of about 66. She was buried at Holy Trinity churchyard on 8 March 1893. Charles was discharged from the army on 15 March 1902 as unfit for military service. At the time of the 1911 census, when he was a bachelor of 42, he was working as a bricklayer’s labourer and lodging with the Smith family in Green Edge Lane, Headington Quarry. By 1914 he was living in Chapel Terrace in Quarry, which is the row of houses near the Methodist Chapel in Quarry High Street. He was probably living with his brother John, who was his next of kin. 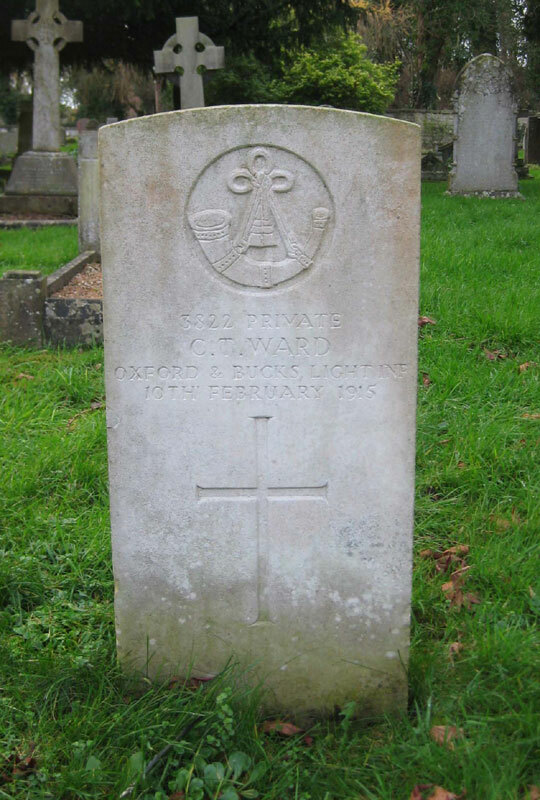 On 17 October 1914, soon after the start of the First World War, Charles Frederick Ward, aged 45, signed up for one year with the 4th (Home Service Battalion) of the Oxfordshire & Buckinghamshire Light Infantry Reserve (Service No. 3822). On 19 October 1914 he was passed fit for service as a local guard in the Territorial Force, but in the event it transpired that he was suffering from valvular heart disease, and 117 days after commencing service he died. The Medical Officer said that the patient was on duty as a Bridge-Guard in November 1914, and suffered frequent colds and then shortness of breath from Christmas. He believed that the conditions to which he was exposed during the performance of his military duties caused a bronchial catarrh which materially affected the pre-existing condition of his heart. He was discharged as permanently unfit for war service on 2 February 1915. 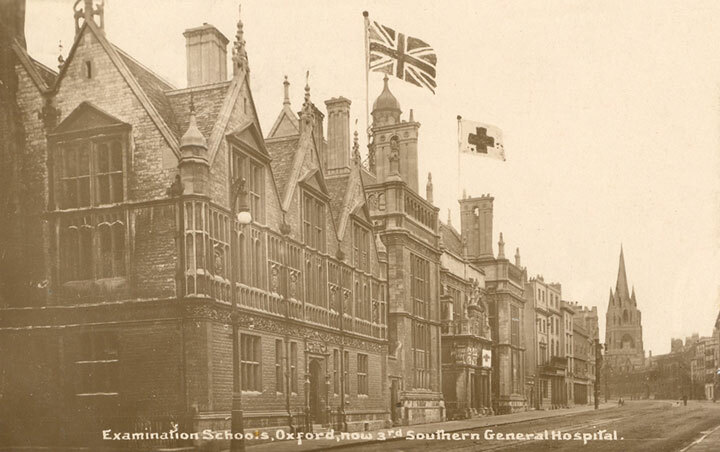 Ward died at the Third Southern General Hospital in Oxford (probably at the Examination Schools) at the age of 46 on 10 February 1915. He was buried with full military honours in Holy Trinity churchyard three days later. In the burial register he was described as “Private, National Reserve”. OXFORD & BUCKS. LIGHT INF. He is also remembered on the stone plaque in the porch of Holy Trinity Church. Elizabeth Louisa Ward (born 1858) married the soldier Edward Collins (34) at Holy Trinity Church on 11 September 1880 when she was about to have another child. At the time of the 1881 census Elizabeth was living at Cowley Military Barracks with daughter Eliza Collins (eight months). By 1891 Elizabeth Collins (32) was a widowed laundress, living in Quarry with her children Eliza (10), Clara (9), Ada (5), and Charles (3). John Thomas Ward (born 1854) married the widow Mrs Sarah Webb at Holy Trinity Church on 26 February 1893. Even though the census of 1861 shows John went to school, both signed the marriage register with a cross. They lived at Chapel Terrace and had three children baptised at Holy Trinity Church: Oliver Thomas Ward (27 May 1894); Sarah Louise Ward ( 29 December 1895); and Edward James Ward (baptised privately on 25 January 1897; died aged three weeks and buried in the churchyard on 30 January 1897).